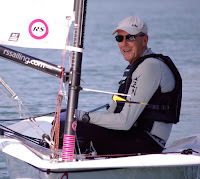 Thanks to those titans of flue gas desulfurization material supply at Oglebay Norton for sponsoring my 69th day of Laser sailing in 2008, my third sponsored sail in a week. I launched at low tide from Colt State Park in Bristol in a light northerly. It wasn't the most exciting sail of the year. But it was a good day to practice some of the light air skills I learned from coaches Rulo and Kurt earlier in the year; have some fun with roll gybes (awful at first but slowly improving); and work on my roll tacks (not too bad this day). Towards the end of the session the wind started to die even more and I thought I would be becalmed about half a mile from the shore. But I couldn't let down my sponsors so I slowly inched my way back to the launch ramp to make sure that I would be able to express my heartfelt gratitude in this post to those wonderful folk at Oglebay Norton. So let's have a big round of applause for my sponsors, and for that matter for everyone in the lime and limestone industry for their work in supplying the essential materials for flue gas desulfurization. Where would we be without them? And what the hell does all this have to do with sailing? I'll tell you where we would be. 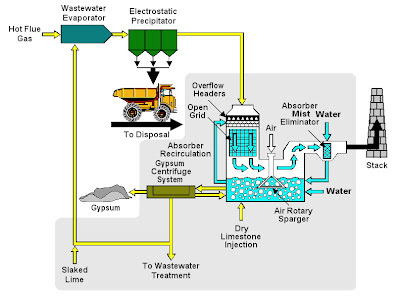 Without flue gas desulfurization we would have more acid rain. And more acid rain means more acid lakes. And who wants to sail in sulfuric acid? That's what is has to do with sailing. 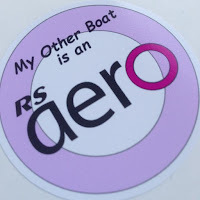 So who will sponsor my 70th sail of the year? Sharpie Fine Point Permanent Markers and Oglebay Norton Flue Gas Desulfurization are tough acts to follow. Any suggestions? Hold the phone...we're in discussions with the Advil people to cover one of the big round numbers. Hmmm. Advil is a bit of a short word to use in my quest to break the record for longest sponsor's name ever. By the way, another sponsorship opportunity is coming up soon. One day early next week Proper Course will be welcoming its 200,000th visitor since we opened our doors in 2005. Any suggestions on how to mark that event? I think the next logical sponsor could well be Job rolling papers. It sounds like you've achieved another cannabinoid moment and are focused in a way that many of us have not been for some years. You have chalked up another first, though. You are numero uno in all of Googledom for Oglebay Norton Flue Gas Desulfurization. At any rate, it may be wise to avoid operating any heavy machinery just now. Do you have any Allman Brothers? soda.... right outta my nose. Congrats on your 69th and your upcoming 200,000th. For your 200k visitor, I'd suggest a lavish prize giveaway. For a sponsor, may I suggest Cemco Turbo Vertical Shaft Impact Crushers and Contract Manufacturing ( http://www.cemcoturbo.com/ )? As for the prizes for Visitor #200K, it's obvious -- a package of top-notch merchandise from all of your sponsors.